At its height, the Saxon kingdom of Wessex sprawled across Southern England, encompassing Wiltshire, Hampshire, Dorset, Somerset and parts of Devon and Berkshire. Even before the Saxons arrived the area had a reputation as a weird place, with Stonehenge and its Druids, Glastonbury and the Holy Grail, the bizarre chalk figure of the Cerne Giant and the reputed location of King Arthur's Camelot. In more recent times the tradition of weirdness has continued, with flying saucers sighted over Warminster, intricate Crop Circles popping up around Alton Barnes and hordes of spaced-out hippies converging on the mystical hubs of Glastonbury and Totnes. This book is a tourist guide with a difference. 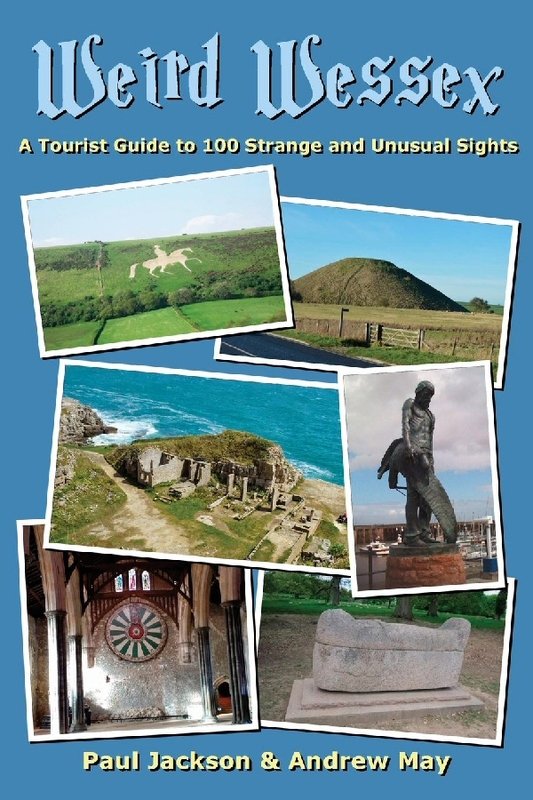 It describes 100 of the weirdest sights in Wessex, ranging from world-famous places like Glastonbury and Stonehenge to hidden oddities that may even surprise the locals. Divided into ten thematic chapters, it is lavishly illustrated with over 200 full-colour photographs. Published by Fortean Words (CFZ Publishing Group) in August 2015 and available as a paperback (ISBN 978-1-909488-35-9) from Amazon UK and other retailers. Also available in Kindle format.